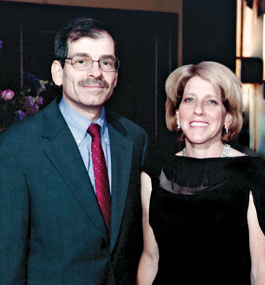 The name of longtime Brandeis National Committee leader Theresa Adler, G’13, will forever be linked to student support at the institution she loved, thanks to a generous gift from Cherie and Gary Aviv. In March, the Avivs established the Theresa J. and Lt. Col. George Adler Endowed Scholarship Fund at Brandeis in recognition of the impact the woman known to all as “Terry” had on her family, her community and the BNC. Adler, long an active member of the Central Westchester chapter, died on Jan. 9 at age 86, leaving a legacy of positivity and giving that inspired everyone around her. Although Adler was involved in a number of organizations, she made the BNC her top philanthropic priority. She served in a variety of chapter leadership roles, even agreeing to a term as president at age 85, and gladly opened the doors of her home to BNC business, from hosting meetings to coordinating mailings. Aviv and Adler met 50 years ago, when Aviv’s father — a career Army soldier who served during World War II, the Korean War and Vietnam — married Adler, who was raising three children following her first husband’s death. Unfortunately, Adler began a battle with breast cancer not long thereafter. Adler and Aviv’s father were devoted to blending their families into one loving, connected group. Each year, the extended family gathered in the Catskills to celebrate Thanksgiving. She adds, “Creating this endowed scholarship allows me and my husband to pass on Terry’s passion for life, my father’s commitment to excellence and their support for education, through a gift to a worthy student, year after year. 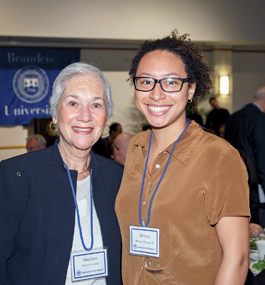 I had the pleasure of meeting Brittany Duncan ’18 (pictured, at right) this spring at the Scholarship Appreciation Luncheon, the annual on-campus gathering of Brandeis donors and the students they support. She is the recipient of the endowed scholarship established by my BNC home chapter, Central Westchester, so I was especially excited to get to know her. Brittany is a very impressive young lady. A biology major, she hopes to become a doctor. She spent last summer as a research intern at the Jewish Genetic Disease Consortium, which increases awareness of and encourages screening for Jewish genetic diseases. She is involved in a number of Brandeis activities, including the Black Student Organization, the Student Union and the Photography Club. Meeting Brittany reaffirmed my commitment to BNC’s mission of supporting Brandeis and its outstanding students. Thank you for joining me in this worthwhile endeavor. 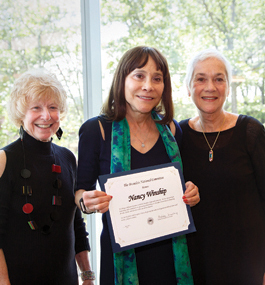 Former Brandeis National Committee national president Barb Sander (left) and current national president Madalyn Friedberg (right) present Nancy Winship, P’10, P’13, outgoing senior vice president of institutional advancement at Brandeis, with a certificate recognizing her efforts in support of the university. To honor her legacy, BNC members raised money to have her name inscribed on the Tribute Wall in Goldfarb Library. During her 23 years at Brandeis, Winship, who connected thousands of alumni, friends and donors with the university, helped raise $1.5 billion. She now serves as chief philanthropic adviser to President Ron Liebowitz. 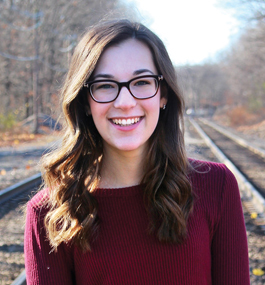 When Remi Miller ’19 was asked to head the Brandeis National Committee’s Student Ambassadors program, she had no idea how rewarding the experience would turn out to be. Today, Miller can take pride in a successful first year as director. During just one semester, she helped recruit more than 20 new student ambassadors. She even designed a shirt for ambassadors to wear when they attend BNC events in their hometown over school breaks. 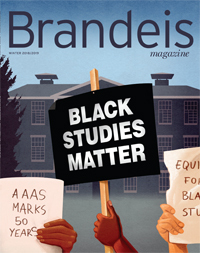 Established in 2007, the Student Ambassadors program lets students share their Brandeis experiences with dedicated BNC members, whose generous support helps the university. At the same time, the students learn about the important part the BNC has played in building Brandeis. She first heard about the BNC from Jacob Abrams ’17, a former director of the ambassadors program. The two met when Miller visited Brandeis as a high-school junior, and they quickly became friends. “Jacob was always a positive influence on campus for me,” Miller says. A psychology major pursuing a minor in legal studies, Miller hopes to attend graduate school to study forensic science and investigative psychology. In addition to her BNC role, she is an Orientation leader and stays involved in many other activities on campus. This spring, she plans to study in London. Her BNC to-do list includes instituting weekly meetings that help the student ambassadors connect with one another as well as find out more about what the BNC stands for and how they can help.